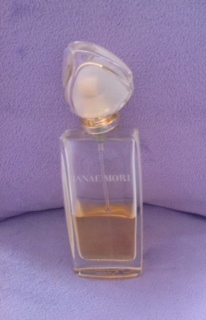 This is my bottle of my favorite perfume, Hanae Mori. It is a great fragrance that my then boyfriend, now husband, bought for me on a Caribbean vacation about 15 years ago. This is time when the bottle half full isn’t a good thing. The other day as I walked past this half full perfume bottle, I was irritated with myself and had to do a little self talk. The reason this bottle is half full and not completely empty is because I put it on a shelf to take down and wear only for special events. Well, I definitely need to change my definition of special events. When I survived breast cancer, I made a list of things I loved to do and said that I would do more of them. I outlined all of the things that have brought me joy from the small (going to movies and comedy shows) to the large (traveling throughout the Caribbean), but somehow in these last 4 years and 10 months, there have been too many times that I let “life” get in the way. The irony is that I know, more than ever, that no day is promised. Life is the reason I should be celebrating. Waking up is a special event. Listening to music (yes, music was on my list) is a special event. Having the opportunity to have a conversation with my husband, 9 year old son or 6 year old daughter is a special event. All of the moments of my life – a life that is not guaranteed – are special events. So, I plan to empty this bottle quickly. (Somehow, I’ve got to get back to the Caribbean soon :-). When I get up in the morning, I’ll dab some on and do what I said I would do, what I’ve urged others to do – celebrate survival, celebrate life ’cause they are special events. EVERY DAY! On the first day of National Breast Cancer Awareness Month 2013, I want to talk about telling our stories. I recently watched Venus and Serena, a documentary about, arguably, the most competitive and highest achieving tennis players in history. The documentary focuses on 2011, but weaves in many other years from the sister’s childhood to their many championship wins into adulthood. What was particularly profound to me was their resilience – from injury, defeat and illness. Their tenacity. I watched the story with pride and in awe of what these two beautiful, young African-American women have accomplished at a young age. But, I also watched their honesty and vulnerability, them allowing cameras to follow them to some private spaces – hospitals and doctor’s offices – as their shared their thoughts about winning, losing, illness and rebuilding. It took me back to many conversations that I’ve had with my husband, sister and friends about my survival. For me, my story seems like a no brainer – do everything you can to survive and have a great quality of life. But, to my family and friends, they often remark in awe about my journey from breast cancer diagnosis to treatment and survival. And, when I think about many events I’ve attended with and conversations I’ve had with survivors, I’m always in awe of and inspired by their triumph and survival. I’m encouraged and often feed off of their energy, especially when I’m facing challenging times. So, as Venus and Serena shared their stories of overcoming sexism, racism, adversity and illness, it resonated with me. As a triple negative breast cancer survivor, I know a bit about overcoming. I know how important it is to hear stories of triumph, especially survival. But, the world will only hear the stories if we, as survivors, tell them. I’ve been at different points along my journey. And, I’ve seen so much more in my own family as a fifth generation breast cancer patient surrounded by countless relatives who’ve battled cancer. But, I’ve heard and witnessed stories of fortitude and such incredible strength (including those of my late mother and late aunt) that encouraged me during my darkest, most hopeless moments. And, I’ve also had the blessing of having others share with me their being inspired by my survival. Our stories of triumph, especially survival – we must share them. We cannot deny the power of our survival and the determination, commitment, prayers and even obstacles that guided our survival. Thank you Venus and Serena for what you’ve done for the sport of tennis, especially for females and African-Americans. You are Champions. Thank you for further inspiring the champion in me. I am a champion – a breast cancer survivor of almost five years. I’m grateful that I’ve lived to tell my story. For all of my survivor sisters, please tell yours. There’s undeniable power and strength in our stories. Most of all, our stories can provide that mustard seed of faith that inspires another. So, with the gift of having more breath in our bodies, let’s use it to give someone else a gift – the gift of hope and inspiration.